This morning Pinterest co-founders Ben Silberman, Paul Sciarra and Yashwanth Nelapati woke up to a barrage of tweets, “So @myspace has completely ripped off @pinterest. It really pisses me off when an old, tired hack tries to undermine hardworking inovators. [sic]” Myspace revealed its new redesign last night and Pinterest users quickly picked up on the similarities between the two site aesthetics, leading to an intense Twitter debate. 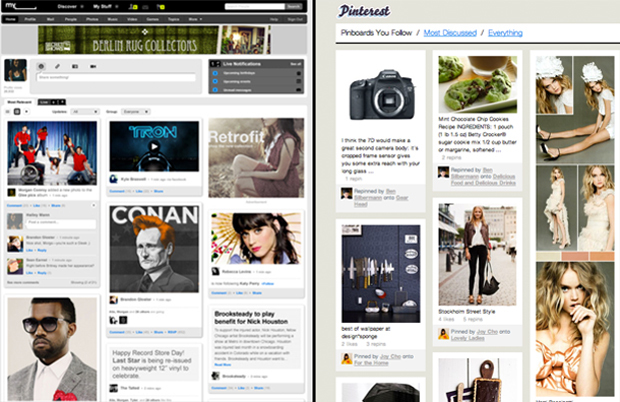 The offsite grid layout used by both Myspace and Pinterest is nothing new; Lazyfeed, http://enjoysthin.gs and countless other sites have a similar design (there’s even a Tumblr theme). But the fact that former Myspace Director of Technology Dave Peck emailed Pinterest back in March asking for an advance invite is interesting, especially when you read the email. However, Silberman who retweeted the accusations from the official Pinterest account this morning, emphasized, “I wouldn’t go as far as saying they ripped it off. They’re probably in tune with organizing friends around interests after they missed the boat on friends,” referring to how you can now use Myspace to follow Topics pages. Myspace had 90 million users this September according to comScore, marking a 18% drop from last year. This recent design and concept overhaul was an attempt to win back some of the traffic lost to competitors like Facebook.